CHAPEL HILL, N.C. (WTVD) -- The lush tree canopy in Chapel Hill's downtown and historic districts is a source of pride, but also cause for concern, according town officials. Emergency crews responding to storm damage on Friday discovered two aging oak trees were no match for the high winds and rain. Crews worked for hours to cut up the tree. "We had a significant storm last night," said Adam Smith, an arborist for the Town of Chapel Hill. "We have a lot of trees in their mature years. 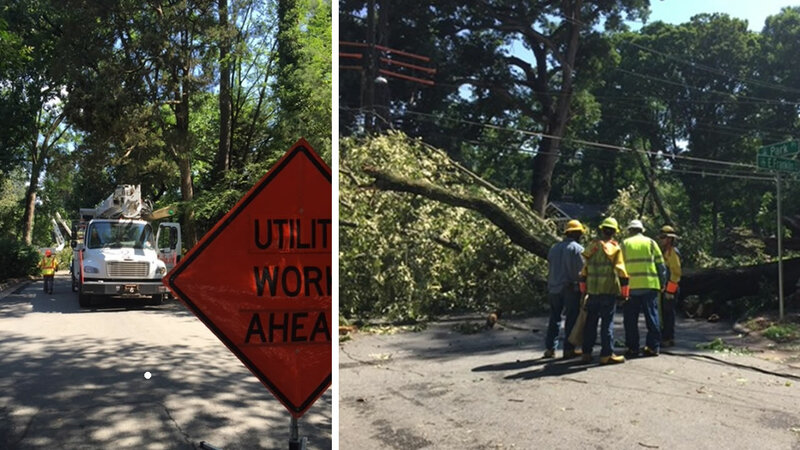 A tree at the intersection of East Franklin Street and Park Place near the UNC campus crushed a power line and blocked traffic for several hours. UNC student Amanda Ferraro lives in a rental home where the tree once stood. While she slept through the storm, she woke up grateful it fell away from the house. "Somebody was watching over me. I had no idea," said Ferraro. "I would've been right in its way. I'm on the ground floor--so either my bedroom or the living room." The old oak was already on the town's radar after a recent assessment of older trees in the downtown area. "It wasn't in such a bad shape that we thought it would come down anytime soon," said Smith, adding that the large oak had sustained significant damage from vehicle crashes and flooding. Town officials already had plans to remove an oak tree on South Columbia on the UNC campus. Utility crews worked to remove it from the road after it snapped and fell in the storm. Smith says the National Forest Service is encouraging municipalities to keep better track of the condition of its trees. The federal agency uses an application called iTree which allows workers to input details about a specific tree. Chapel Hill is working on its own app that would be available for download on the town's website. Instead of filling out paperwork for an aging tree, citizens with GPS on either a laptop or a mobile device would be able to identify a tree's location and automatically submit a work order. The town would keep a public database of tree conditions and the status of work orders.